There are literally hundreds of different types of cheeses in the world. If you’re a cheese enthusiast yourself, you may be familiar with the popular cheddar, parmesan, and mozzarella but have you ever tasted high-end cheese like burrata or comté? Whether you have or haven’t, there are cheeses out there just waiting for you to dig in to. If you’re looking to go on a cheese adventure, you’re in the right place. Today we’re exploring the top 10 cheese of the month clubs to help you open yourself up to a whole new world of cheeses. These clubs allow you to taste gourmet and hard-to-find cheeses you’re not likely to see in your local grocery store. If you’re a cheese lover who simply isn’t satisfied by a classic cheddar cheese, you’ll want to check out The Gourmet Cheese of the Month Club. Instead of settling for whatever pre-packaged cheese you can find at the local deli, with this club you’re going to get a high-quality selection of some of the finest cheeses delivered to your door each month. In fact, you’ll find three different types of cheese inside your monthly box. That gives you plenty for snacking, cooking, and most importantly, enjoying with a glass of wine. One of the reasons we really love this cheese club is because all of their cheeses are artisanal, hand-made, and from all the around the world. Thus it gives you the opportunity to discover new tastes, textures, and types of cheese you otherwise wouldn’t have been able to try. What can you expect to receive in your box? Here’s a sample of what The Gourmet Cheese of the Month Club has sent previously: Camembert, Port Salut, Wensleydale, Gorgonzola Piccante, Lancashire, Mahon, Manchego, Bleu d’Auvergne, Dry Monterey Jack, and Mirabo Brie with Walnuts. Another delicious cheese club option to check out is the Cheese of the Month Club from Amazing Clubs. They’re known for offering a variety of gourmet gifts of the month, making it easy for you to get regular fixes of all your favorites, including cheese. And their Cheese of the Month subscription makes for the perfect gift for a loved one or a nice treat for yourself. In each order, you’ll receive a selection of raw-milk, farmhouse-style cheeses that have come from speciality cheese producers all around the world. Inside your box you’ll find three new and different varieties of cheese on your doorstep each month. Each one will come in weighing a massive 1/2 pound each. And since all of these cheeses are produced with all natural ingredients, you can feel better scarfing them down. 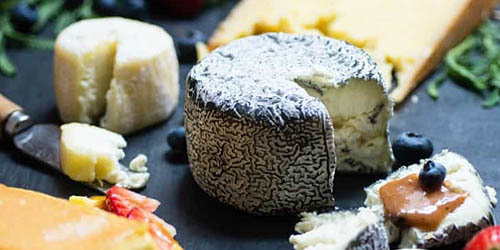 Previous cheese selections from Amazing Clubs have included: Parrano, Coffee Stout, Gruyere, Mediterranean Gouda, Blueberry White Cheddar, Cheshire Five Peppercorn, Madrigal Swiss, Naked Goat, Drunken Goat, and Asiago Mezzano. As one of the oldest cheese clubs on this list, Dean & Deluca has been around for over 40 years. When you subscribe to a three-month, six-month, or 12-month subscription, you’ll receive a delivery of artisanal cheeses that have been hand-selected by their in-house fromager. If you’re unfamiliar with the word, a “fromager” is an old-school word for cheese merchant. Think of them as the sommelier of the cheese world. Offering both domestic and imported cheeses, you’ll experience seasonal favorites picked for quality and delectability. Dean & Deluca’s selection ranges from soft, delicate cheeses to those that are hard and pungent. So if you’re looking for a diverse set of cheeses that will stimulate and challenge your palate, this cheese of the month club could be your best option. You’ll receive a description of each cheese in your box, which allows you to learn more about it and its producers. The Tasting Board (previously called Bright Cellars Cheese) is a cheese club that works a bit differently than the others on this list. Their monthly subscription service is actually curated to your tastes, unlike others that send every customer the exact same cheeses. With The Tasting Board, you’ll complete a survey that allows them to get to know your unique taste profile. From there, you’ll see the cheeses they think you’ll love based on your preferences. Each month, you’ll be able to try four new cheeses that have been specially matched to you. And these aren’t just any old cheeses! They’re awarded winning cheeses from around the world. On your potential menu, you’ll find cheeses such as: Montchevre Tomato Basil Fresh Goat Cheese, Sartori Extra-Aged Goat Cheese, Red Barn Family Farms Heritage White Cheddar, and Saxon Creamery Big Ed’s Gouda. Murray’s Cheese of the Month Club is one of the only cheese clubs on this list that has been featured in Oprah’s Must-Haves. And if it’s good enough for Oprah, it has to be pretty spectacular, right? Each month, you’ll receive a delivery of three different half-pound cheeses for you to try. These cheeses will vary in flavor and texture. Past boxes have included: Maribo with a toasty and brothy flavor, Moliterno al Tartufo that’s luxurious and mushroomy, Murray’s Mac & Cheese Blend with its nutty and pungent taste, the buttery and silky Sweet Grass Dairy Green Hill, and the earthy and salted caramel flavor of Point Reyes Bay Blue. You can live the cheesy life when you join the Di Bruno Cheese Club. For as long as you’re a member, you’ll receive a curated selection of cheeses from their “cheesemongers” (customers) each and every month. They actually offer three different options for someone looking to satisfy all their cheesy cravings. You can join The Kilo Club, the Eat Like a Cheesemonger Club, or the Cheese Pairing 101 Club. With The Kilo Club, you’re going to get a solid chunk of cheese at your door, which is sure to put a smile on any cheese lovers face. It’ll be fresh and ready for you to enjoy, whether you make it a snack or use it for preparing your next weeknight meal. They also offer seasonal cheeses, which includes favorites such as L’amuse Gouda and gourmet options like Cravero Parmigiano Reggiano. If you choose the Eat Like a Cheesemonger Club, you’ll receive a fine selection of cheeses alongside some curated favorites that compliment these cheeses. You could receive caviar, foie medallions, squid ink spaghetti, capers, and more. With the Cheese Pairing 101 Club, you’re going to become a pro at matching cheeses with complementary treats. You’ll receive cheeses, nuts, jellies, jams, crackers, and plenty of other must-haves. Get ready to impress your friends with your knowledge! Delivering more than just cheesy goodness, CheesyPlace ships out monthly deliveries of three hand-picked cheeses and one to three gourmet food items with their Cheese of the Month Club. It’s a must-have for any cheese lover, especially if you’re looking for an easy way to get ahold of hard-to-find varieties. With each order, you’ll find a box filled with goodies. There will be three artisan cheeses that have been hand-selected by their cheese mongers. Plus, you’re going to find a few extra items inside. You’ll receive anywhere from one to three gourmet products, which can include extra cheese, condiments, or something else. CheesyPlace will also include a fact sheet with descriptions and pairing notes. Past boxes have included: Cave Aged Gruyere, Chateau De Bourgogne, Beemster Classic Cheese, Chèvre Noir Aged Goat Cheese, and Bella Lodi Black Parmesan, among others. There’s a chance you may already be familiar with Beekman cheese. That’s because the founders (also brothers) have a reality TV show on The Cooking Channel called “The Fabulous Beekman Boys”. Oh, and they both won CBS’s The Amazing Race in 2012. In addition to their reality TV fame, they also make really great cheese. Their farmhouse-style cheeses are produced in limited quantities to ensure the highest quality. As a result of their quality and popularity, they tend to sell out quickly. However, you can guarantee you’ll get your fix when you sign up for their cheese club, which sends deliveries every quarter. Here are some examples of cheeses you’ll be able to get your hands on: Chevre, Ghoast, Blaak, and Kaastavond. While technically not a cheese of the month club, Wine Down Box is still a great option. Why? Because instead of simply just sending you cheese, they send you perfectly paired cheese, cured meats, and wine. We liked it so much it’s included in our favorite wine of the month club list. This club is slightly different than the others. It encourages you to bring it to get-togethers and share with friends. It’s a great excuse to relax, “wine down”, and enjoy some delicious cheese and wine pairings. Last but certainly not least on our list is the Wisconsin Made Cheese Club. It’s an award winning club that gets you one heaping pound of delicious Wisconsin cheese delivered to your home every month. And with something new in each delivery, you’ll appreciate the easy access to so much variety. As you probably already know, Wisconsin is known for their cheese. It comes down to farmers who passed down tradition and cheese making recipes dating back to the 1800’s, when dairy farmers had excess top quality milk. In order to preserve the milk the farmers made cheese out of it. Fast forward to today and we’re still reaping the benefits of those farmers preservation tactics in the form of delicious, gooey cheese! The Wisconsin Made Cheese Club is great for those who love their gourmet cheeses, but they don’t like to stray too far outside their comfort zones. There’s nothing too crazy in this subscription service. Here are examples of what you might find in your box: 1-Year Aged Cheddar Cheese from Widmer’s Cheese Cellars, Baby Swiss by Cedar Grove Cheese, Brick Cheese from Babcock Hall Dairy, Gouda Cheese from Marieke Gouda, Havarti Cheese by Decatur Dairy, Mild Cheddar Goat Cheese from Mt. Sterling, Smoked Gouda by Marieke Gouda, and Colby by Jim’s Cheese. They Go Above and Beyond: A cheese club is not necessarily a staple in your life, it’s a specialty product. Being a speciality product, it should satisfy you to the utmost degree. We looked for cheese clubs that went the extra mile in everything they did. This includes packaging, cheese curation, including more information on the cheese, and more. Satisfaction Guarantee: Great cheese should could from great businesses. That’s why all of the clubs on this list have some guarantee in the form of a refund, return, or more. Variety: As we mentioned in the beginning, there are hundreds of different varieties of cheeses spanning from all over the world. That’s why we chose clubs that offer an immense amount of variety in what they send their subscribers. Each month should be a cheese adventure! Quality: Last, yet probably the most important element that we took into consideration was quality. Good cheese is everywhere, great cheese is hard to come by. These clubs we chose have shown a dedication to superior quality cheese. First, think about who this cheese club is for. Is it for you or a gift for a friend/family? If it’s for you, think about your personal preferences when it comes to food. Do you like trying new things or sticking with the “tried and true” — there’s a club on this list for both. If you’re shopping for a friend, consider what they like. And, when in doubt, just go with the Food Box HQ favorite. Second, consider price. Click around and see which cheese clubs fit your budget. We included clubs that fit a wide range of budgets, from around $30 and up. Last, think about the quantity of cheese you’re receiving. Yes, the one-pound of cheese from the Wisconsin Made Cheese Club may sound incredible but are you going to actually eat it all? Have you tried any of the cheese of the month clubs on this list? Have a question about one of them? Leave a comment below and we’ll get back to you as soon as possible! Our Favorite: Di Bruno Bros.